Luca Landucci (1436–1516) was one of those regular people who lived in medieval Florence. He owned an apothecary, and while his business had its ups and downs, he eventually became prosperous. He married and had 12 children before passing away at the age of 80. The reason why he stands out among the thousands of ordinary Florentines of his age was that he kept a diary, starting when he was about fourteen years old, and continued to write in it until his death. In it, Luca reveals much about the daily life happening in Florence, as well as what he knew about the greater political events that were taking place in his city and Italy. September 12, 1489: “The Palagio de’ Signori was struck by a thunderbolt at about 14 in the morning (10 am); it struck the lion and pursued it way downwards. There were two strangers at the top, just next to the bells, when it happened, a chancellor of the Pitigliani and another. The former fell unconscious, as if dead, and the other was little better; however, they did not die after all. Neither was there a great deal of injury done to the Palagio. It seemed wonderful that this should have happened to two strangers, when there were hundreds of Florentines in the Palagio. People went to look at the tower and bells afterwards. April 5, 1492: At about 3 at night (11 pm) the lantenr of cupola of Santa Maria del Fiore was struck by a thunderbolt and it was split almost in half; that is, one of the marble niches and many other pieces of marble on the side towards the door leading to the Servi were taken off in a miraculous way; none of us had ever in our lives seen lightning have such an effect before. If it had happened at the time when the sermon was being preached (for a sermon is preached every morning now, with 15 thousand people listening), it must of necessity killed hundreds of persons. But the Lord did not permit it. This marble niche fell and struck the roof of the church between two doors which lead back to the Servi, and broke the roof and the vaulting in five places, finally fixing itself in the brick floor of the church. And many bricks and much other material from the vaulting fell also, reaching as far as the benches placed for the sermon, where many people would have been sitting. Some material fell in the choir as well, but not very much. Many pieces fell outside the building as well, beyond the door leading to Servi; one piece falling on the stepping stones in the street, and after having split the stone, burying itself underground; another piece was hurled across the street, and struck the the roof of the house opposite the said door, where it split the roof and many beams and vaultings, and finally buried itself in the ground under the cellar. Although the house was full of people, no one was injured. A man called Luca Ranieri lived there. You may imagine that they nearly died of amazement and terror at the fearful noise; for besiddes that which fell into the cellar, many pieces fell on the roofs all round. August 6, 1492: There was a furious storm, the air seeming for some time to be full of bursting fireworks, so incessant was the thunder and lightning. When the storm was over, about eight different places were counted which bore visible traces of having been struck. One was the Campanile of Santa Croce; another was Porta di San Gallo; another the Porta al Prato; another the Porta a Pinte, etc. But it did not cause much damage, and no one was killed. September 2, 1502: An evergreen oak in my villa, only 50 paces from the house, was struck by lightning; and it was seared and dried up to very roots, never recovering. September 12, 1503: In less than half an hour six or seven thunderbolts fell in Florence; amongst the rest, there was one which fell on the gate of San Piero Gattolino (Romana), and another on San Giovanni, which caused the cross to fall to the ground; and another in Via Gora, and others in several parts of the city. And outside there were yet more. At Peretola one Bartolomeo Nelli was riding along the road, when the lightning struck him, killing him and his horse; another horse which was a little behind was terrified and went lame. Two other deaths were spoken of, one at Poggio a Caiano, and one at Calenzano; whilst in a house in the Mugello a man, woman and child were killed. June 4, 1506: On this day, at my place at Vegna, the lightning struck quite near the house, touching a very large oak, which no one remarked, there not being a scratch upon it; nothing whatever to be seen. But in a few days the top branches, which were full of acorns, began to whither, and every day it went on whithering lower down, till in less than a month it was dried up to the very roots, and has never shot up again. 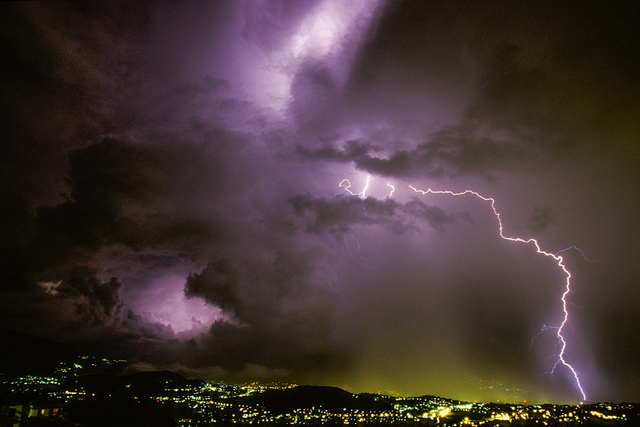 November 4, 1511: On the night following this date, two thunderbolts fell in Florence in the middle of the night. One struck the Palagio de’ Signoria just above the dial, and coming down into the court, twisted a certain bronze band which was at the base of the ‘David’ in this court; an it also displaced a pilaster of the door which is at the foot of staircase, and broke certain marble steps higher up by the Sala, and the same again above. Outside it came down by the door, and stained and spoilt three lilies above it, which was considered a bad omen for the King of France. And another struck the cupola of the Duomo, displacing about three niches, although they did not fall; and this meant some trouble for the Church. September 3, 1512: A thunderbolt fell on the Palazzo degli Strozzi here, and killed a master-builder, who had built this palace, and now he had come back to give a look at something, and was so unfortunate, after having been in danger so often while building it, to die in this way when the danger seemed over; but so it pleased God. He was a good man.